L3 Narda-MITEQ designs and manufactures various types of Frequency Synthesizers, including sources based on phase-locked-loop (PLL) technology to lock the phase of a voltage-controlled oscillator (VCO) to that of an inherently more stable reference source, such as a temperature-compensated crystal oscillator (TCXO) or an oven-controlled crystal oscillator (OCXO). Such synthesizers can be designed with a single loop for optimal frequency switching speed, or with multiple loops when lower noise performance is required. In essence, they can be called integer-N synthesizers where N is the multiplication factor used to determine the output frequency as a multiple of the reference source frequency. 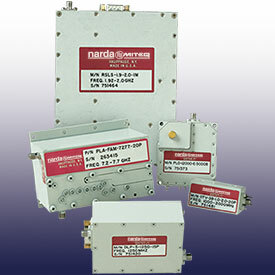 L3 Narda-MITEQ can offer customized solutions that meet your specific requirements.